Five players have today been delisted by the Lions. Rohan Bewick will play his 100th AFL match against the Geelong Cats at the Gabba tomorrow. Rohan Bewick is a hard-running player with a penetrating kick who tasted senior WAFL action before joining the Lions as a mature-age recruit at the end of the 2010 season. He seems to do his best work either on a wing or across half-forward. • Rohan Bewick - the nephew of former Essendon premiership player Darren - played his junior football in Western Australia and eventually graduated to West Perth's senior side in the local WAFL competition in 2010. • He was selected in the West Australian State squad, but suffered a leg injury which forced him to miss the State game. • After the injury, he returned to West Perth where he produced an outstanding finish to the WAFL season. He averaged 20 disposals per game including a career-high 32 possessions against reigning WAFL premiers Subiaco. • At the Draft Combine, he grabbed the attention of AFL recruiters with a range of impressive testing results including a 14.7 shuttle run and a 10 minute 18 second 3km time trial. 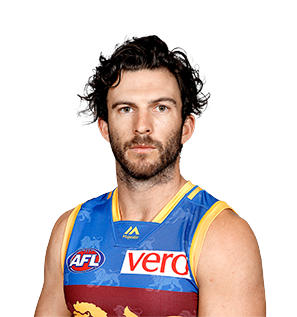 • The Brisbane Lions secured Bewick at the end of 2010 as a Previously Nominated or Previously Listed Player from the Gold Coast in a complex trade which saw Jared Brennan join the Suns and a host of draft picks exchanged. • Bewick played eight Senior matches and was a big part of the Lions NEAFL side's premiership victory. • Kicked three goals and gathered 15 disposals in the comeback victory over the Bombers in Round 15. • In a season troubled with injury, Rohan Bewick played 14 games for the Lions. Groin and hip injuries interrupted an otherwise standout season for the West Australian. Bewick averaged 15 disposals and 3.3 tackles playing on the wing. • Despite playing unaffected by injury this season, Rohan Bewick struggled for consistency, often falling out of sight of the selection panel. • Rohan played 15 games for the Lions in 2015 and travelled frequently as the team’s emergency. • Nominated twice for ‘Mark of the Year’, Bewick wasn’t afraid to climb heights and made the most of opportunities as they were presented. • Rohan kicked three goals against the Giants in Round 10 and collected a season high 25 disposals against the Western Bulldogs in Round 23. • Under a new coaching regime, Bewick had a somewhat stunted start to the 2014 season, He played just four senior matches in the first half of the season, and failed to have a great impact in any of them. • His terrific midfield form in the NEAFL eventually warranted a call-up in Round 12, and he rewarded the selectors' faith with a career-best 30 touches in the team's upset win over the Bulldogs at Etihad Stadium. • Playing largely in the midfield and on a wing, Bewick maintained his spot in the side for the team's remaining eight matches, with his elite running ability and raking left-foot proving a valuable asset. • He bettered his disposal tally against Fremantle in Round 22 when he collected 33 possessions, and earned his first ever Brownlow Medal vote for his effort against Melbourne in Round 19. • Despite missing six matches, Bewick still had a personal-best finish in the Merrett-Murray Medal when he placed 14th. He also polled 21 votes in the NEAFL MVP award (the second most at the Club), despite only appearing in a handful of Lions Reserves matches. • Bewick was the Lions' fourth highest goal-kicker throughout the Club's pre-season campaign, and was a member of the breakthrough NAB Cup premiership side. • Playing largely across half-forward, he played a personal best 19 senior matches, and spent the other three as the team's emergency. • He booted 15 goals for the season, and equalled his career-best with three against Carlton in Round 9 at the Gabba. • Bewick was selected in the Lions’ senior team for their Round 1 match against Melbourne, but after a couple of modest outings, he was sent back to the Lions Reserves side for the next five weeks. • He was recalled in Round 8 to face the GWS Giants – making the most of his opportunity with 24 disposals and six marks. • Bewick proceeded to play in 14 of the next 15 senior matches, which included a personal best stretch of 10 consecutive games between Round 8 and Round 18. • He seemed to find his niche up forward, where his strong overhead marking and lethal left foot proved a dangerous combination. He kicked at least one goal in 12 of his last 13 matches – including a career best haul of three against Adelaide in Round 21. • His 18 goals for the season came at an average of 1.1 per game, ranking him equal fourth on the Club’s 2012 goal-kicking tally. • An improved second AFL season saw Bewick take his career games tally to 28, and finish a personal best equal 15th on Club Champion night. • After impressing the Lions' coaching staff throughout the pre-season competition, Bewick was selected to make his senior AFL debut in the Club's season opener against Fremantle at the Gabba. • He collected 15 disposals and kicked a goal in a solid debut game, and backed it up the following week in the team's loss to the Western Bulldogs with a career-high 23 possessions. • He was used effectively as the 'sub' in Round 3 against Melbourne at the MCG, and amassed 13 disposals and five marks in just over a quarter of football. 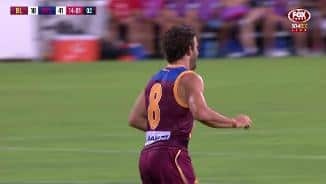 • But after landing awkwardly on his back early in the Lions' Easter Thursday match against St Kilda in Round 5 at the Gabba, Bewick missed the following two weeks. • He returned in Round 8 against Essendon and went on to play in eight of the next nine senior matches, before ultimately being sent back to play in the NEAFL with the Lions Reserves. • He finished his debut season with 12 senior games - which was the most by any of the Club's 11 debutants in 2011.